These eyes were made in the late 1800s or early 1900s either in France or Germany. They are real prosthetic eyes. Each one is unique. 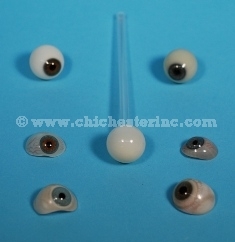 The glass eyes were hand-blown from glass to form the basic eyeball. The iris was made seperately and was then attached to the round ball. The two pieces were then formed into a useable eyeball. Our Gxx codes denote individual pieces. If you would like to order a specific pair of antique glass eyes, please go to our Gallery to pick the exact one shown. The eyes make for great conversation pieces, especially when placed in the bottom of a Martini glass. Enjoy!! !